Home Reliable When does a Lie, become a Lie? When does a Lie, become a Lie? We have all fabricated the truth. A little ‘white’ lie when we were kids, so we wouldn’t get in trouble. A little dishonesty is part of our Human Nature. Programmed to believe that if you need to evade the truth, for the goodness of all, then so be it. And of course in the case of falsifying to save someone from embarrassment, or getting hurt, negative karma is exempt. Telling a tall story to save face isn’t so bad, for instance the fisherman that always comes home with a tale of ‘the big one that got away’. 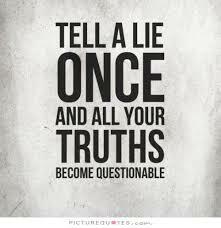 All of these kinds of lies don’t really jeopardize or undermine anyones trust. A lie that doesn’t damage someone else in an abusive way or that doesn’t slap us in the face, could we really say it’s a down right dirty lie? I suppose when I was raising my children, I used to say to them ‘ a lie is a lie and one should never tell one’, at least not to your Mother. I am sure all three of my adoring youngsters could write a book about how they managed to misrepresent the truth from me growing up! I bet we would have a good laugh about it too. When does a lie, become a lie? Dishonesty gets nasty when someone in your life doesn’t have your best interest at heart, and knows it. Deception is ugly when someone in your life is manipulating you with a calculated distortion of all the goodness that you stand for. Deceit becomes terribly wrong when the words from another person begin to impair the better judgement of yourself. The mendacity of someone else becomes harmful when their words are destructive to your Soul. Lying to someone to hide the forgery of their promise to you, is a lie. When someone tells a lie that has a consequence of defamation to your character, would be considered a harmful lie. Someone inaccurately telling you the truth because the truth is they don’t respect you, that is abusive. If you know that someone in your life is in fact being dishonest with you, then you are better off without them. Their deceit is their problem and if they have made it your responsibility in any way, leave the relationship. Because your responsibility to yourself must be to know in good faith, when a lie becomes a lie. Dirty, disgusting, foul, ugly lies have no place in your life, not if you want happiness and peace. If you know that someone, whomever they are, are not being completely honest with you about who they are, what they are or how they are treating you – GET OUT! !